I heard a rumor today that Apple is shortly going to allow third-party applications on the iPhone. They won’t be full applications, however: they’ll be Desktop Widgets. You will soon be able to drag any Dashboard Widget into iTunes, and they’ll sync with the iPhone, the source said. But the source did say that Apple hasn’t released iPhone widgets yet because Java has proven to be a major draw on battery power. Presumably, Apple has figured out how to tackle this problem. How? Again, the source didn’t say. Unfortunately, this is all I know. I promised not to reveal the source of the rumor, but they’re well-placed. This is coming from just one source, via a third-person, so I’m only 70 percent confident it’s true. When I worked at MacWeek, we’d never publish rumors as news until it had been confirmed by at least three separate sources. However, the redoubtable Glenn Fleischman reports for TidBits that Apple is getting near to making third-party applications available for the iPhone. Glenn has no details, but suggests the release is imminent. 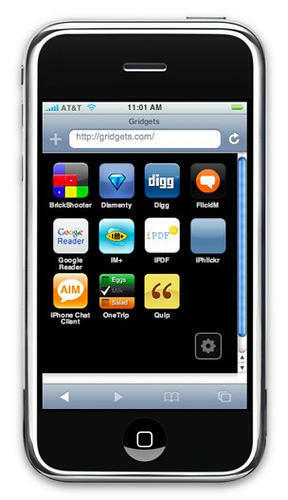 Widget support on the iPhone makes sense. Safari runs on it, after all. Java, a whole ‘nother story, and I think it’ll be a long wait for Java on the iPhone. When he says “virtually nothing” he means “nothing”. Java is a drain on battery power… Hehe, I had a little chuckle at this story. Also, by “Desktop Widget” do you mean a Dashboard widget? That “Java has proven to be a major draw on battery power” has apparently not been noticed by other cell phone manufacturers, who have happily supplied Java on much smaller devices for years. Today, Java is an excellent way of delivering mobile applications, with more or less equal performance to native apps. If you don’t believe that, do check out the Opera web browser for mobiles, which compares favorably in speed and features with native browsers. In fact, the absolutely dominating battery drain on a mobile is the display, and in particular the back light, and secondly, the power needed to transmit radio to the cell base station. Runnning the processor at full steam is a minor load compared to these. It would be a logical way for Apple to allow third party apps since, I believe, both the Stocks and Weather iPhone apps are basically just existing OS X widgets modified to work on the iPhone. Hmm, sounds like your source doesn’t know what he’s talking about. Still rate this as 70%? I was predicting you could use DashCode to create widgets for iPhone back before they announced the phone. Then when iPhone came without it, I figured they HAD to announce DashCode widgets at the last WWDC. [As seen in my blog at http://lepton68.wordpress.com] Now I say they will come with Leopard. It’s a no-brainer! In fact it is such a no-brainer I think this was planned for the intro of iPhone from the beginning, and what messed it up was the delay of Leopard. Back when both were planned, they were going to appear relatively close to each other. So as planned from the start, we will see Leopard with a DashCode app that will be able to create iPhone widgets. And I think this is a decent way to make iPhone apps with good security. His urging, we waited. You re beinghonest, bisexual eva mendes naked and pulled them off.